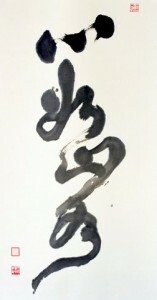 Qi Calligraphy and painting is both a special form of art, and a unique way of Qigong. For the last twelve years or so, Qi Calligraphy has been an important way in Zhixings’ own Qigong practice. Zhixing finds that the energy which channels through the calligraphy is extremely empowering. Also the information which comes with the calligraphy, which is often in poetry form, is most inspiring. Some Hua Gong methods such as the Return Journey, and the Turtle & Snake are a direct result of the inspiration of the calligraphy. Profound philosophy and principles for Qigong practice can often be read or decoded from the poems and paintings. When Zhixing occasionally feels tired, he often uses his calligraphy and paintings to draw energy and to recharge himself. The intention of this retreat is to share the experience of Qi Calligraphy as a powerful way of Qigong healing and practice. If it is good enough for Zhixing, it should be good enough for his students. The calligraphy retreat in the past had an emphasis on the art aspect, therefore spending more time on learning to write calligraphy. This will not be the focus on this retreat. Instead the calligraphy will be used as a way of Qigong practice. In particular, the following ways will be used as the main way of Calligraphy Qigong. 1. By Looking at a piece of calligraphy or painting and responding to the Qi transmission. This is a powerful way of practising Qigong and receiving a Qi treatment. It has been used in other retreats as a way of Qigong meditation. For example, for years in the Five Emotion practice, we have used Qi Calligraphy as a means to enter a special state of consciousness, and therefore to transform our emotions. In the return Journey retreat we have used a painting known as the Master to evoke massive energy and powerful effects. However it is not the focus to practice with the calligraphy on any other retreat. On this retreat, it will be the main way to practice our Qigong, and we will have a chance to maximise the special effects of this method. 2. By observing Zhixing writing calligraphy. As many of us know when Zhixing writes calligraphy, there is a great energy channelled through which has powerful healing effects. Zhixing can tune in on a collective level with the group, or on an individual level for one particular person. It is like a group or individual Qigong healing treatment. The effects are often extraordinary. 3. By holding a piece of calligraphy in your hands, or close to the body, as a way of healing or obtaining energy. This is a powerful and restful way of healing and meditation, especially valuable for people who are ill or not very strong. Together with the more active and invigorating practice with the calligraphy, the content contained in the paintings and calligraphy, often in the form of poetry will be explained. This gives beautiful and inspiring information, both instructive and enjoyable. The reading of some of the poems can initiate a powerful transmission of Qi energy and information. Image contemplation functions as an overall introduction and transmission of the Hua Gong energy and information. The “Images” are illustrations of the Hua Gong philosophy, principles and inner processes. The level of our Gong can be measured by how much or how well we embody these images.